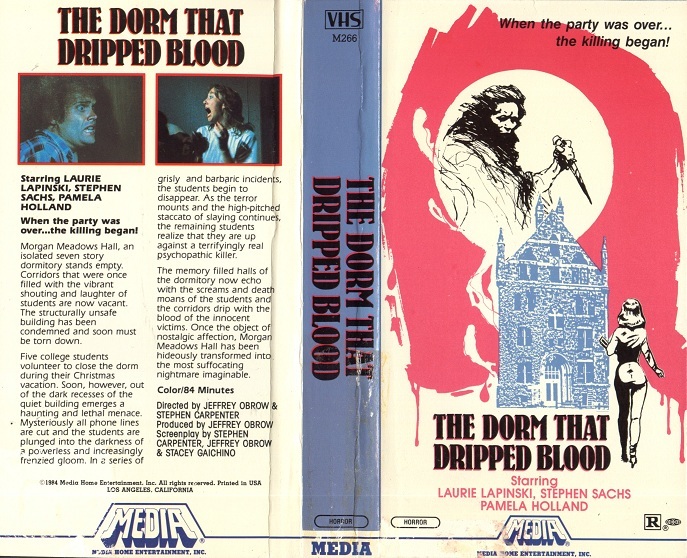 Digi-Schlock: THE DORM THAT DRIPPED BLOOD (Synapse Blu-Ray/DVD Combo) – Schlockmania! Slasher film buffs have good reason to love digital cinema formats because they have been pretty good to this most often censored of genres. For instance, MGM made it possible for fans to see an uncut version of The Burning went they went back to the original negative for their DVD and restored all the choice effects that were shorn to ensure an R-rating. LionsGate’s excellent blu-ray edition of the original My Bloody Valentine was another fine example, giving viewers the option to incorporate never-before-seen snips of gore that were cut from the theatrical version at the last minute. 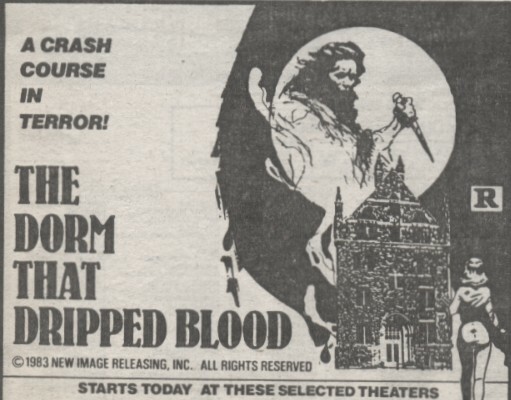 Discoveries like those breed eternal hope in slasher fans that their MPAA-brutalized favorites will be allowed to shine once more in their uncut glory on home video. If you’re a fan of that persuasion, then you definitely need to check out Synapse’s blu-ray/DVD combo pack of The Dorm That Dripped Blood. 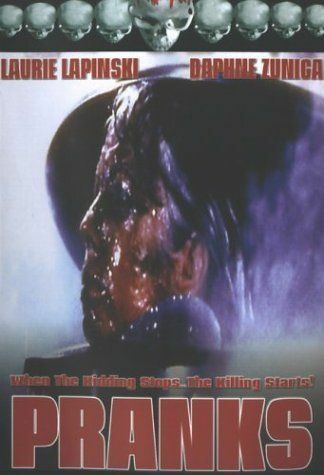 This release represents the first time that any fans have been able to see this lesser-known slasher uncut – and offers a nice little package of extras, to boot. Things get started with a brand new anamorphic transfer taken from the original answer print of the director’s cut, which is presented with its original title of Death Dorm. It restores all the Matthew Mungle gore FX that were snipped to appease the MPAA – which are really impressive for such a low-budget venture – as well as few other trims made from other scenes. This film was shot on 16mm and blown up to 35mm so the image quality isn’t demo material but its likely as good as the film will ever look given the circumstances. The grainy texture of the blow-up has a nicely cinematic look with strong colors and nice shadow detail. The cleanup job done on it looks great: you’d swear it came from the negative. The audio sticks to the orignal mono mix and its a solid one that makes great use Christopher Young’s violin-sting score. The package is completed by some nice extras. The first of these is a commentary track by co-writers/directors Jeffery Obrow and Stephen Carpenter. It’s an easy-going but enthusiastic track that offers plentiful production stories. Obrow and Carpenter discuss how they took advantage of available equipment and locations at UCLA to get their first film while still students going as well as the challenges of getting it into the marketplace. They also offer some advice to young filmmakers on how they should go about getting their own first feature going. Finally, they’re likeably self-deprecating about their choices as first filmmakers, pointing out moments that don’t work and questionable plot twists. There are also a pair of featurettes produced by Michael Felsher: “My First Score” is built around an interview with composer Christopher Young while is an interview with FX creator Matthew Mungle. Both are short, punchy pieces that follow a similar narrative line: it was the first film gig for both Young and Mungle so they gave it their all despite limited resources. Young also talks about how being a musician colors his approach to the rest of the world and Mungle speaks frankly about the pain of laboring over effects that got from the film (his piece features some interesting side-by-side comparisons of the theatrical and uncut versions to illustrate the point). One might wish these pieces were longer but they’re well-done and effectively edited. 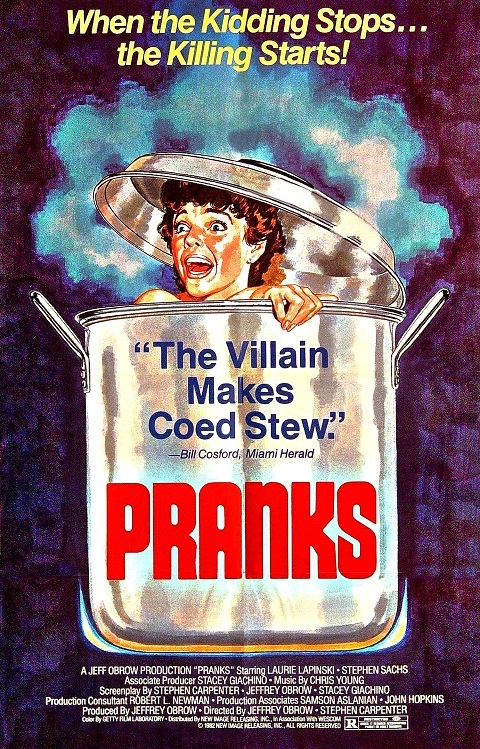 The package is rounded out by two different theatrical trailers for the film: one under its The Dorm That Dripped Blood title and the other under its initial theatrical-release title of Pranks. The latter is particularly interesting in how it tries to force a “practical joke” angle on the film that doesn’t exist and makes it easy to understand why the film was retitled. All in all, this is not just a fine edition of a lesser-known film – it’s a heroic reclamation of the film on a par with the aforementioned The Burning and My Bloody Valentine discs. The fact that it’s combo-pack that offers both Blu-Ray and DVD editions in one slim package further sweetens the deal. If slashers are your thing, you should make some room on your video shelf for this release.